Ghost are currently embarking on one of their biggest tours yet, following the release of their critically acclaimed third album ‘Meliora’. Known for their theatrical live performances, Ghost consists of five nameless ‘ghouls’ and is fronted by the imposing ‘Papa Emeritus’. The connections to ‘Kiss’ are obvious but there is more to this group than their image alone. They recently graced Manchester with their presence at the Ritz, and firmly staked their claim as one of the best live acts in the metal scene at the moment. The theatrics started before any of the band members set foot on stage. A throbbing red light was accompanied by dry ice and burning incense, all to the sounds of angelic hymns and monk choirs. The venue started to feel and smell like an extremely bizarre church. The effect was soon broken as the intro to ‘Spirit’ from ‘Meliora’ began to play, followed by the ‘Ghouls’ entering the stage. ‘Papa Emeritus’ was the last member to appear and was met by the screams and cheers of an extremely diverse sold-out crowd. I myself stood next to two old Scousers who traded war stories about attending metal gigs in the 70’s and 80’s, whilst a father and son stood in front of me. This variety in age is another confirmation of the quality of the music Ghost produce, and its accessibility. Their sound, whilst recognisably ‘metal’, is less aggressive and primal than other bands in the genre. Theirs is a more cerebral sound, which is intertwined with their striking visual image. The strong start to the set, which featured the likes of ‘Ritual’ and ‘Per Aspera Ad Inferi’ soon got the crowd warmed up, with the first pits beginning to open amongst the ground floor crowd. One audience member even took it upon himself to jump on stage to give Papa Emeritus a cheeky peck on the cheek, before stage diving back into the crowd to evade the security guards. This didn’t go down too well with the main man himself however. He publically called out the perpetrator and claims had he seen him coming, his foray onto the stage might have ended more violently. Papa Emeritus soon took control of the crowd however, describing the next song on the set-list (Body and Blood) as an extremely gastronomic experience. The effect of his speech seemed to be emphasised by his almost ‘Dracula’ like Swedish accent. Imagine Dracula was dressed a gothic pope and said these words, “This next song is about the eating of flesh and the drinking of blood.” Text does the quote no justice but let me assure you this is the moment in which the mood and theatricality of the performance sank in for the crowd. The crowd which was to become witness and actor in a satanic communion during the next song. Papa Emeritus introduced us to the ‘Sisters of Sin’ (Again the Dracula accent made this far more entertaining), a pair of girls picked from the audience now dressed as Nuns, holding a chalice of wine and some bread. During the song ‘Body and Blood’, they gave devilish communion to front row of the crowd. This extra touch completed the whole experience of almost taking part in a piece of performance art. Every aspect of Ghost as a band is extremely well thought out. The image complements the music and sometimes the other way round, but the performance itself ties the two together. An experience is how I would best describe this gig. It was more than a band playing their music, it was a band enveloping the audience with a sonic and visual experience. The only other band I have seen do this live is Muse and Ghost blew them out of the water (I’ve seen Muse four times so trust me on this one). Before attending this gig I had listened to Ghost, particularly their latest album ‘Meliora’, and had taken a shine to their sound. However I wasn’t particularly fond of everything they had done. I saw some of it as gimmicky and cheesy, a few bad songs that spoiled the really good ones. Now I can honestly say, having gone back and listened to all three albums that I like almost every single song they have done. Going to gigs usually leaves me listening to a band on repeat for a while and further exploring their discography but they have never actually changed my mind on songs I had already heard. I rolled my eyes when ‘Mummy Dust’ came on but the live performance of the track seemed to add a new dimension to it, a dimension I can now hear more clearly on the recorded track. This if anything is proof for me at least, that Ghost are only going to get bigger and reach more people with their music. Now I am very aware that as a review this seems rather one-sided. Yet to find fault within this performance would be finding a fault for argument’s sake. Maybe Papa Emeritus talked for too long, or perhaps he wasn’t as funny as he thought he was. Perhaps the set-list wasn’t as varied as it could have been. These are all minor complaints that did not detract from the experience in any meaningful way. The music was excellent, the quality of instrumental talent on show was first-rate and the overall performance was outstanding. Without a doubt this way my best gig of 2015. 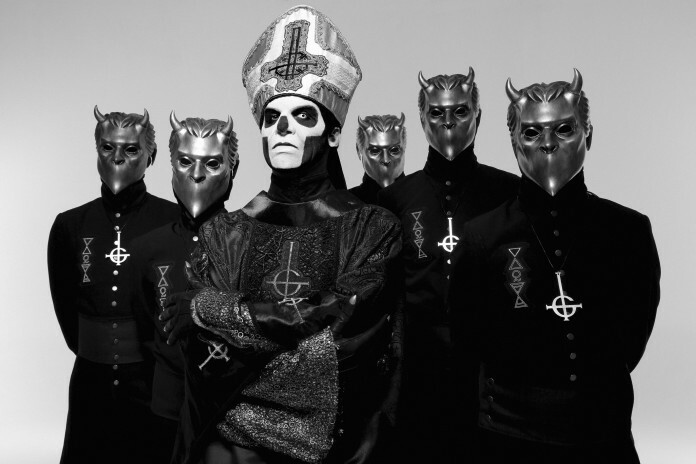 For those of you who have never heard of Ghost I would encourage you to listen to them, make your own judgements and if you do take a shine to them, buy a ticket for their next tour. It’s a show you will not want to miss out on.